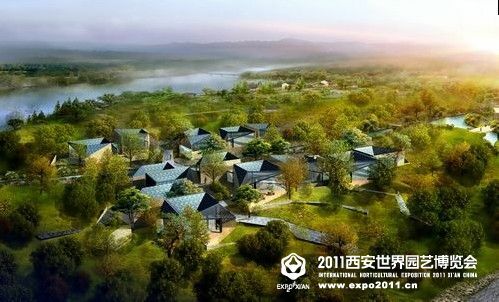 The World Horticultural Expo will be held in Xian, China from April 28th, 2011 to October 22nd, 2011. That is a six month window of opportunity for any keen gardeners or horticulturalists who would like to see amazing displays of the latest plants. The 2011 World Horticultural Expo is themed as “Eternal Pease & Harmony between Nature & Mankind, Nurturing the Future Earth” It will be held on a new site in Chanba District, between the airport and the downtown. The one of the landmark of the World Horticultural Expo is Changhan tower. Chang'an is an ancient capital of more than ten dynasties in Chinese history, today known as Xi'an. Chang'an literally means "Perpetual Peace" in Classical Chinese. The exterior styling of the Chang’an Tower has the characteristics of traditional timber-structure pagodas of the Tang Dynasty: every layer of roof overhang has a layer of supporting pedestals with a patterned layer-by-layer structure. The second landmark of the World Horticultural Expo is The Greenhouse located at the Splendid Lake. Displayed in the house would mainly be rare plants and eco-landscapes from different regions of various climates in the world. 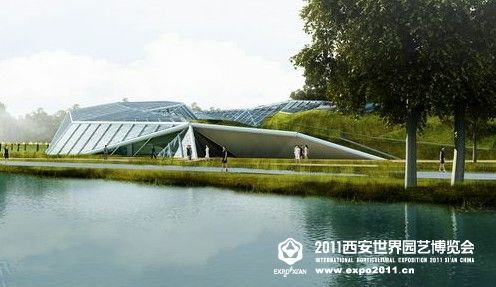 The Theme Pavilion, the third landmark of the World Horticultural Expo is centrally located and was designed to be integrated with the surrounding water and land terrains. Its architectural layout is in the shape of the Chinese character “王” consisting of irregular tri-wing geometrical objects. The Guangyun Entrance, fourth landmark of the World Horticultural Expo 2011 Xi’an is the main entrance made up of water features and square flowers gardens, with horticulture features paving the way and well-integrating with the Chang’an Flower Valley. The World Horticultural EXPO will feature three service zones to display the terrific architectural complexes mixed with vast and beautifully arranged landscapes. 1) “The Romance by the Ba River” Service Zone displays a village environment full of fields and gardens as well as fun. After appreciating the varied expo landscapes, the visitors will feel calm and relaxed when they come to this zone. 2) “The Southeast Asian Park” symbolizes the essence of nature, health and recreation. Coconut trees, palm trees and other various tropical plants decorated by abundant bushes make a vigorous world of tropical gardens. 3) “The European Street” service zone design is based on the extraction of traditional European royal horticultural styles (such as geometrical-pattern landscape planning) with the combination of typical planning characteristics (the combination of axes, square, obelisk, oblique and linear blocks; typical urban texture like foundation and inside courtyard) of European urban residences as well as countries and towns. There are three Featured Parks showing achievements of Chinese architecture and the latest developments in landscape gardening. 1) Poetic Landscape in Chang’an Park - reproduce the beauty of the plants described in The Book of Songs and certain techniques were adopted in the design to evoke a traditional Chinese cultural ambience. The scenery reflects the profound and ancient Oriental culture, show the vicissitudes of the Qin Dynasty and reveal the challenges posed by the ecological crisis of our day. 2) Qinling Park Aiming at displaying the bio-diversity of Qinling Mountain the Xi’an Horticultural Expo introduces to the exhibition the “Four Treasures of Qinling”: panda, takin, crested ibis and golden monkey. In order to show the harmony between human and nature, the design of animal cages and exercise yards in the Qinling The Park is skilfully done according to the actual land shape, following tightly the principle of merging into the environment. Visitors can go to the Panda Valley to see the charmingly naïve pandas or go to the Lack of Crested Ibis to see the dance of the “Oriental Ruby”. They can also sit in the mountain and watch golden monkeys playing around. 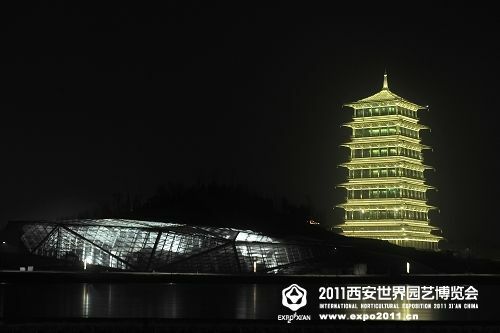 3) Chang’an Park has a design theme as “interpretation of new concepts of green, ecology and Chinese style”. It has Space Plants & Space Science Education Exhibition Zone, Bamboo Culture Exhibition Zone, Herb Culture Exhibition Zone, Cultural Water Front Exhibition Zone, and Peonies Exhibition Zone. China Holidays, leading China Specialist organises Garden tour of China with two days visit to the World Horticultural Expo in Xian. The unique tour departs on the 9th Septembers and includes visits to Beijing, Xian, Guilin, Yangshuo, Suzhou, Hangzhou and Shanghai. The tour includes visit to the Botanical gardens of Beijing and Guilin with local horticultural expert. For more information please check China Holidays website, email us at Sales@ChinaHolidays.com or call us at 020 74872999.